With the weather getting warmer, you may be gearing towards a kitchen purge and a fresh start! It may seem like a daunting task, but we have a few tricks up our sleeves to help you prepare your space for the warmer months ahead. Cut through the clutter like a pro! Before you dive in, the best way to start is by de-cluttering your space. Sort through the nooks and crannies of your kitchen and remove anything that doesn’t belong. Open your cabinets and drawers and get rid of duplicates, broken utensils, and things that you don’t use. The best way to get rid of buildup in your pantry and drawers is to move all food items and cookware to a spacious table or countertop. Check all food labels and discard anything that’s expired, stale or empty. Take this opportunity to wipe down shelves and inserts with soapy water or a multi-purpose cleaner. Use storage racks and boxes to arrange your food in an organized manner, like you would see on shelves or drawers in a store. Damp soft cloths are a great way to clean cabinet fronts and surfaces. Cleaning products should never be sprayed directly onto wood. Instead, apply the product to a cleaning cloth and use in moderation. Keep in mind that using too much product or water can have negative effects on your cabinetry. Our tip is to remove everything from the countertop and use some warm soapy water and a microfiber cloth. 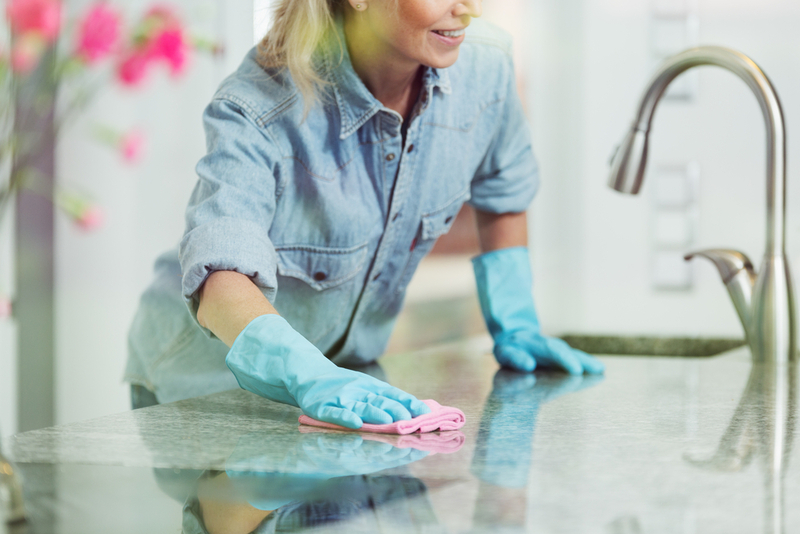 Using surface-specific cleaner can help with the longevity of your countertop. However, no matter the material, it’s important to avoid acidic cleaners, as those can scratch the surface. When it comes to cleaning your floors, move everything out of the way and clean areas that are typically hard to reach. To make this process easier, we suggest fitting your table and larger appliances/furniture with swivel casters. With a gentle push, your vacuum will reach those nooks that are always hard to get into. Even if you wipe down your appliances regularly, a fresh season calls for a bit more than a damp cloth. Since all appliances require different cleaning techniques, we suggest consulting the owner’s manual to better understand what’s safe and effective when cleaning both interiors and exteriors. Our tip is to soak removable parts in warm, slightly soapy water. For non-removable sections, you can loosen a hardened spill and clean hard to reach crevices with a warm water and toothbrush. Have you started your spring cleaning? We'd love to hear about your own tips and tricks in the comment section below.